Last season, many people were surprised to see just how dominant of the quarterback Jameis Winston was as a redshirt freshman. Not only did he take over as a starter for the Florida State Seminoles, but he was able to lead them to a perfect season and the national spotlight. 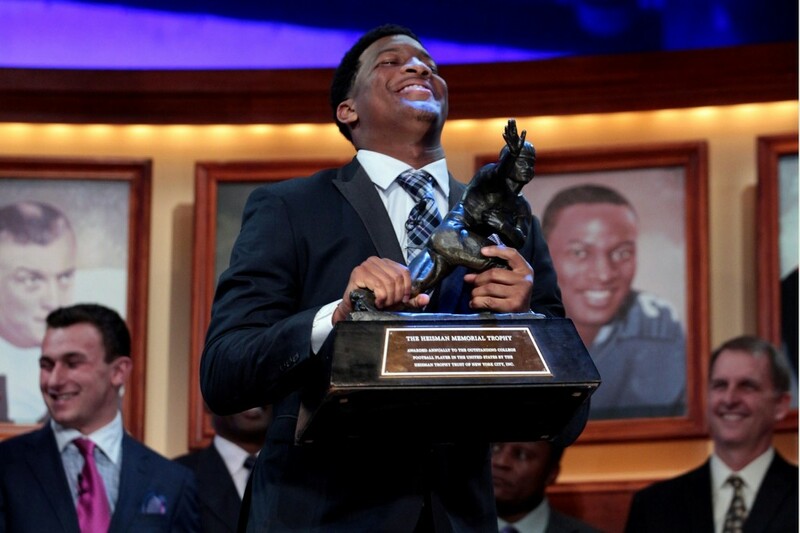 He was rewarded with the highest honor individually as he was named the Heisman Trophy winner in 2013. With a strong cast coming back to support him, many see him winning it again. However, it is going to be tough for him to match Archie Griffin as the only other multiple winner of the prestigious trophy. Quarterbacks seem to have an advantage these days, and the two biggest competitors right now for the Heisman Trophy award are Marcus Mariota and Braxton Miller. Both of these players will be playing on national title contenders, and that right there lets them in the discussion. Neither of them are considered to be the same type of prospects as Winston as far as fantasy football is concerned, but they could surprise some people. Oregon probably has a slightly better shot at winning the national title this year, so Mariota slides into that top challenger role when it comes to trying to knock off Winston. There are other quarterbacks who could also make a run, and those include Bryce Petty out of Baylor and Brett Hundley out of UCLA. There are many people who think that Hundley could be a fantasy football standout down the road. However, UCLA has not been a legitimate title contender for a while, so it could be hard for him to stay in contention. Petty is pretty much in the same boat. Baylor scores a lot of points, and he might be able to put up some very impressive numbers. The team needs to win and be competitive if they want to get their quarterback notoriety. If a quarterback is not going to win the award, there are two running backs who currently have the chance to get a lot of carries and play for a championship contender. Todd Gurley is coming off a very strong season with the Georgia Bulldogs, and they have a pretty favorable schedule to go up against. TJ Yeldon is currently Alabama’s best bet to possibly put up a fight for the Heisman Trophy award. They might be down a little bit and not be as dominant, but a strong campaign from the durable runner could put them in contention. It might seem like Winston has a chance to win another Heisman Trophy, but a lot of things can happen during the 2014 season. It would not be shocking than the least if Florida State did not contend for another national championship, and Winston fell out of contention one way or another.